Find resources to become a certified pharmacy tech, with certification information, practice tests, study guides and courses. The PTCE is administered by the Pharmacy Technician Certification Board and the ExCPT is administered by the National Healthcareer Association. (800) 363-8012	 The Pharmacy Technician Certification Exam enables technicians to work more effectively with pharmacists. 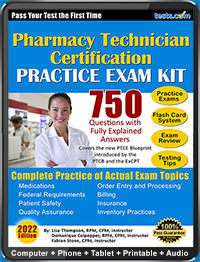 Pharmacy technicians may take the PTCE and ExCPT to become certified as a pharmacy technician. The two examinations are optional, yet beneficial, to individuals seeking employment in the field of pharmacy. To learn more about the PTCE and ExCPT, see our PTCE and ExCPT Guide.